On some days I eat for comfort and on other days I cook to provide comfort. The embrace of food is real and close. And sometimes it’s okay to walk into its arms for succour. A particularly demanding week and long hours for the family, called for a dose of dolce on the weekend. I had a brown paper bag of beautiful scarlet apples and one of the most delightful apple recipes I’ve come across. Way easier than apple pie, I made a delectable Whole Wheat Brown Butter Apple Galette to lift our tired spirits. “What is a galette?”, you ask. 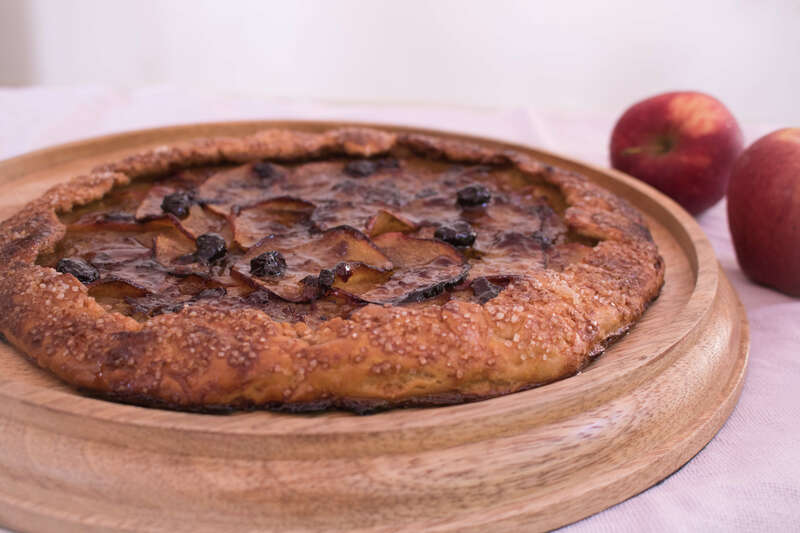 Very French and a little rustic albeit in an elegant way, a galette is a free-form tart or shallow pie of shortcrust pastry usually filled with fruit or vegetables and even cheese. It’s like pastry play dough, you can shape it as you want – circles, squares and rectangles are all allowed. The only rule is that the edges are have to be folded in to hold the filling and to prevent any juices from leaking out. Baked on a cookie sheet or baking tray, galettes are unfussy, straightforward, simple and a great last minute option if you’ve had no time to plan. 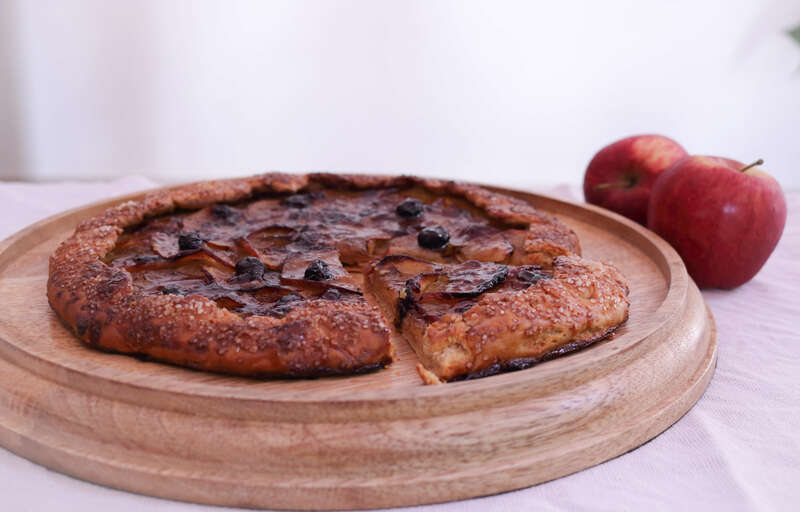 If you like the flavours of apple pie but like me, but prefer a lighter, crisper version, the galette is for you. This one is a favourite on my list of apple recipes. Inspired from Phyllis Grant’s version on Food 52, mine has a whole wheat crust and blueberry preserve instead of regular flour and apricot glaze respectively. I also cut down on the quantity of cream in the egg wash for the pastry and it turned out just fine. To all those who fear that a whole wheat crust will be stodgy, I say that this crust will make a believer out of you. It’s crisp and flaky and every bit as good, if not better than regular pastry flour. Whole wheat also makes for a better looking galette, because its nutty colour browns beautifully yielding a warm coffee toned crust. Apple recipes are more often than not desserts that are eaten warm. They also almost always have cinnamon as a seasoning since apples and cinnamon compliment each other so well. A little different from other apple recipes, this one has vanilla in place of cinnamon. But this small change creates changes the flavour in a big way. Mixed with the brown butter, the vanilla becomes caramelly with a mouth-watering aroma that I wish I could trap in a bottle. It was the smell of warm, cosy love that would spread like liquid toffee inside our stressed bodies with every bite of the galette. The final touch of gloss on the tart was the blueberry glaze. Gently warmed blueberry preserve brushed ever so lightly on the still oven-fresh galette enhanced its darkly attractive sheen making it quite irresistible. This galette has the homey, handmade look perfect for the family dinner table, and yet it is incredibly elegant. The thin, wafer-like apple slices and the fragrant vanilla brown butter make it delicate and worthy of a dinner party. So, if you have a mandolin, use it on setting number 2 to get translucent discs of apple which absorb all that warm butter and get lightly browned yet soft in the oven. If you don’t own a mandolin, make sure you slice the apples thinly. This is key to achieving the perfect look. We ate the galette plain but a dollop of vanilla ice cream or a glass of dessert wine would partner beautifully. The next time your hue is blue, and your tongue begs a wisp of sugar, and you are rifling through your apple recipes looking for a pie, try a Whole Wheat Brown Butter Galette for sweet solace. 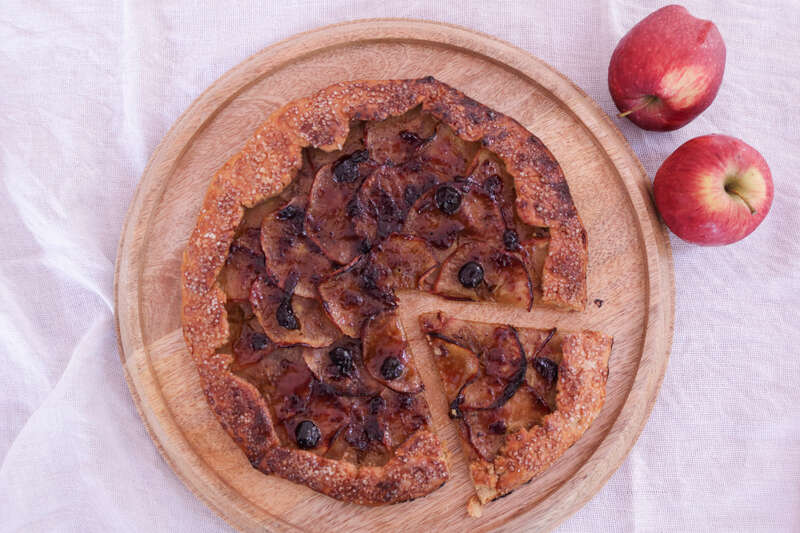 A crisp whole wheat apple tart drenched with fragrant vanilla brown butter. To make the shortcrust pastry, cut the cold (almost frozen) butter into the flour in a food processor and whiz till the mixture resembles breadcrumbs. Alternatively, rub the cold butter quickly into the flour using your fingertips till it resembles moist breadcrumbs. Add 3 tbsp cold water into the processor and pulse for 20 seconds. Remove into a bowl and bring the dough together into a rough ball. Similarly, use a fork to stir in the cold water and use your hands to bind the dough, without kneading or too much handling. Wrap the pastry in clingfilm and chill in the fridge for 20 mins. Gently heat 3 tbsp of butter in a pan till it foams and spatters. Heat it a little more till it turns brown and the dark particles sink to the bottom of the pan. Cool and whisk in the vanilla extract. Meanwhile, core the apples and slice off the top and bottom part of each apple to get a flat surface (keep the skin on). With the mandolin on setting number 2, slice the apples into thin discs. Preheat the oven to 232°C and place a pizza stone or a cookie sheet on the rack till it gets hot. Roll out the chilled pastry on a parchment to a diameter of 12 inches. 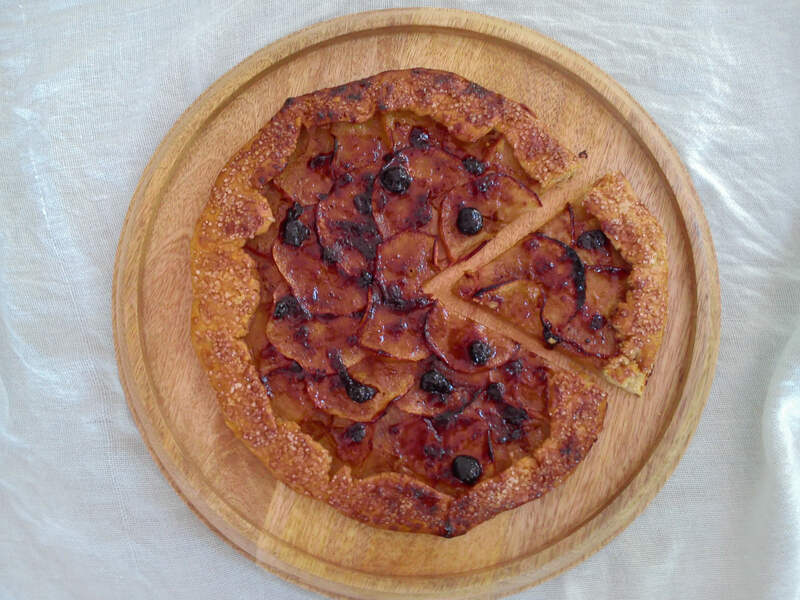 Arrange the apple slices in a circular overlapping pattern starting 2 inches from the edge of the pastry and finishing in the centre. Brush the apple slices generously with the brown butter and fold the outer edge of the pastry to cover half the outer layer of apples. Press to seal any holes. In a bowl, whisk the egg with the heavy cream. Brush the egg wash over all the exposed pastry and sprinkle the turbinado sugar all over the galette. Carefully, remove the heated pizza stone / cookie sheet from the oven and gently slide the parchment with the pastry onto it. Bake for 20 min until the tart is cooked and the pastry is browned. Remove the cookie sheet and slide the parchment out. Brush with the warmed blueberry preserve and bake for a further 2 min. Once done, the galette will slide smoothly onto a plate. Serve warm or cold. Hi! I have been following your recipes , this apple pie is the best . Thanks for sharing it. Thanks for writing in Simi and thrilled you like the recipe ☺. Look forward to more comments and suggestions from you.